Last week I flew to Madison, Wisconsin from South Bend, Indiana. There was a short layover in Chicago, and the entire trip was supposed to take a little more than 3 hours. It turns out, a small fire on a plane is good enough cause to ground it (thankfully) and thoroughly checked over by the mechanical crew. It also turns a 45 minute layover into a 5 hour layover. I know it’s not the worst layover an air traveler could have, nor was it the longest I had on this particular trip (which is another story). I do know when a trip that you could have driven in 4 hours turns into an almost 8 hour air adventure (there were other delays on the first leg of the trip), the passage of time seems to come to a stand still. It’s as if each minute is stretched into ten, an uncertain tempo of time takes over, and you find yourself nervously checking the flight boards only to find that what you thought had been nearly an hour was only just a few moments. I tried to capture the sense of it with the video below, in which 2 minutes of quick travel along the neon-lit underground walkway between terminals is stretched into 20 minutes. To recap, I was delayed for almost 5 hours, a length of time that was longer than my original intended flight time. I had been up since 4:30 AM in order to make my original flight, which was delayed 2 hours upon arriving at the first airport in South Bend. United gave us no snacks, drinks, or any other form of comfort while we waited for the plane with mechanical issues to be checked out and then ultimately replaced with a new plane. And I missed the bulk of an important meeting of the advisory board of an exciting new platform for sharing ideas, activities, and ideas around games in education. By the time my plane finally boarded I was a bit groggy, my brain fuzzy around the edges, and was thoroughly convinced that I had spent 24 hours at O’Hare International, not 5. I hope the video captured my mood effectively; it was a rather simple creation, and I had fun putting it together in iMovie, so much so that I turned it into a ds106 video assignment entitled “Video Your Mood“. The challenge for participants in ds106, or for any students in a digital storytelling or creative writing course, is to recreate a mood or feeling using nothing but the original audio and video captured during the moment. 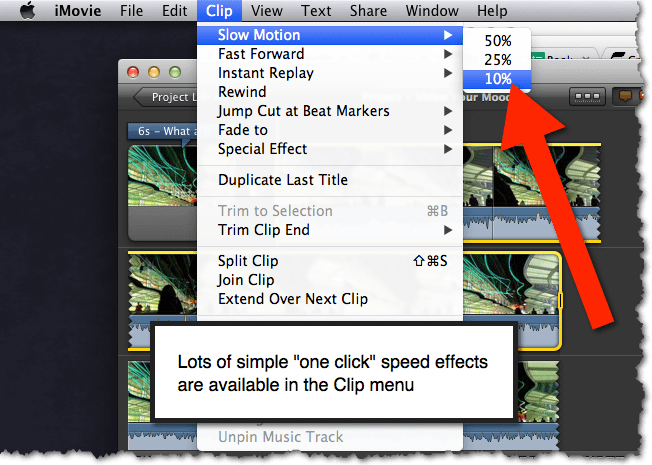 You can time-warp the video, add effects, or remix the audio, but no other elements can be added. In this case, slowing the video down to 10% of its original speed worked nicely. Not only did it turn the neon-lit wave across the ceiling of the underground into a slow motion rainbow, but the low bass-filled growl of the moving walkway mimicked the constant white-noise of aircraft in flight, the “engine” of the underground becoming a soothing soundtrack for a long layover. I felt the effects of the “time-warp” helped convey my sense of time passing slowly. Thanks to iMovie, it was rather simple to alter the speed. Users of iMovie please take note, this is the full iMovie application on Mac OSX. The mobile version of iMovie does not allow you to alter video speed. The “fuzzy around the edges” clarity brought on by waking far too early in the morning (4:30 AM!) and having far too little caffeine in my body was made equally as simple in iMovie thanks to one of the Video Effects. 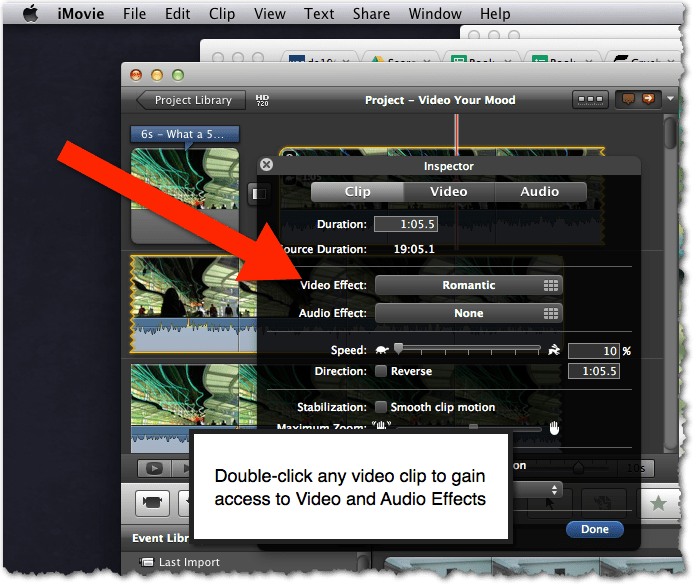 A simple double-click on any video clip gives you access to both one-click audio and video effects. From ethereal “grogginess” to alien x-ray vision, there are enough simple effects to make most amateur videographers and digital storytellers happy. As it turns out the trip wasn’t all that bad, as I did get the pleasure of sitting next to Lucy Gray for the final leg of the journey (we both serve on the same advisory board for the Playful Learning Network). It was nice to meet her, and get to know a little bit about the work she does in education, the connections we share, and have a rather pleasant travel companion after so many hours of wandering the back corridors of Concourse F, looking for an unused power outlet to charge my phone and laptop so I could put this video together. This is great, Ben! I have been on that moving walkway so many times, and this version seems to capture its fundamental essence very well. I love the sound, especially. And thank you for the useful tutorial! I should be posting more screen shots when I explain things…that’s really helpful.